Well this particular post isn't a new recipe for me (that post is coming later tonight), but I just wanted to blog about it because it's rather dear to my heart. I've never really been a fan of Bakewell because I find it ridiculously sweet. The jam never tastes of anything other than red, sticky stuff and its usually got icing on the top too. Another one of those tooth-rotting recipes. Plus sponge and pastry together. Sometimes I'm a bit fussy like that. In the way that I still, at thirty-something years old, won't eat pudding and custard in the same bowl. An indulgence my grandmother started and my mother still despairs at to this day. In some ways, that's a bonus because having gained a sweet tooth with the birth of my daughter, I'd probably be more likely to eat pudding in the canteen at work but they won't indulge my pecadilloes. It's pudding with custard or go hungry. Some people are so harsh! Anyhow one day when I was expecting, I was at my mum's and she had the spoils of the cakes left over from her contribution to some do or another. She proffered a piece of her bakewell and despite my initial reticence, I gave in to baby's will and ate it. It was amazing. What makes the difference is that she uses Polish cherry jam from Lidl. 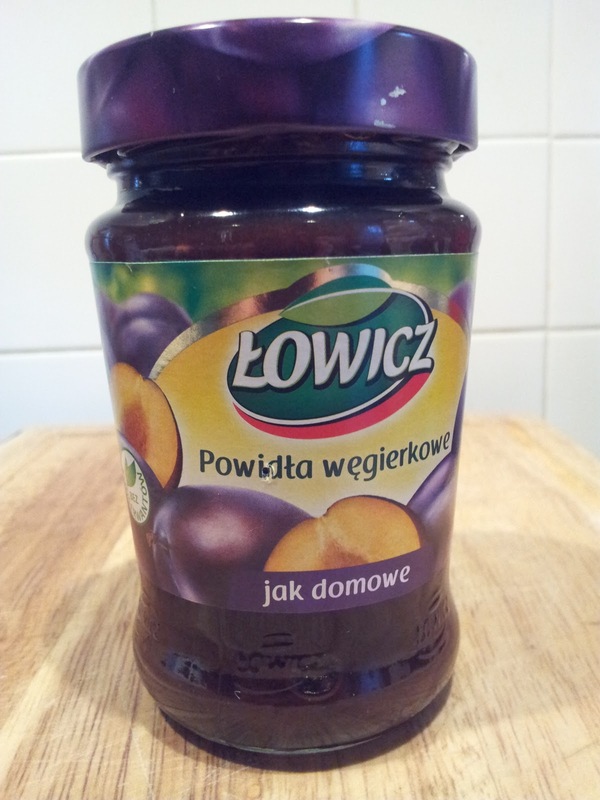 That's jam from Poland. Not jam made from polished cherries. Because the jam is so fruity and sharp, it cuts through the sweetness of the sponge. And my mum doesn't ice her Bakewell - topping it instead with baked almonds. 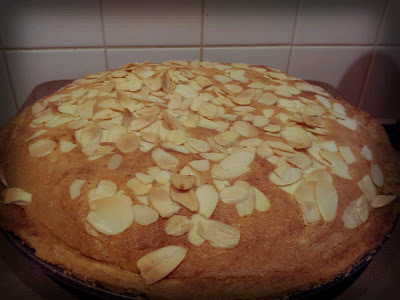 And she uses almond sponge rather than frangipane. All of which goes to making a delightful Bakewell. A while later, my boss was on a no-chocolate kick and we had a bake sale at work so I chose to make the Bakewell to make sure he stumped up and bought some. He had the first slice, declared it the best Bakewell he's ever eaten and it sold out in about two minutes flat. Since then, it's been a regular request from the people at work and I'm baking it today as part of my birthday celebration. Somehow though, I've managed to mislay two jars of the prized cherry jam between here and Winchester so I had to buy an emergency jar of Polish Plum Butter from Tesco this morning. Again, amazing flavour - I had a little taster out of the jar just to check I shouldn't plump for Bonne Maman blackcurrant instead. As for the recipe, this is my version. I've tweaked it a little by adding ground almonds and a little almond essence to the sponge, but it will always be my mum's recipe. Her topping recipe is based on the weight of three eggs. You weigh the eggs and use the same amount of sugar, flour and butter. I find that three eggs-worth is always a bit to much but two eggs-worth is not enough if you're using a nine-inch tin. So for the sake of simplicity, I've put the actual weights in the recipe as my eggs weighed 175g today, but do try the egg-weight method. Add in the almond essence then beat in the almonds and flour and 2tbsp of milk. Remove the pastry case from the oven, cover the base with the jam and then top with the sponge mixture. Sprinkle the sponge with the flaked almond.